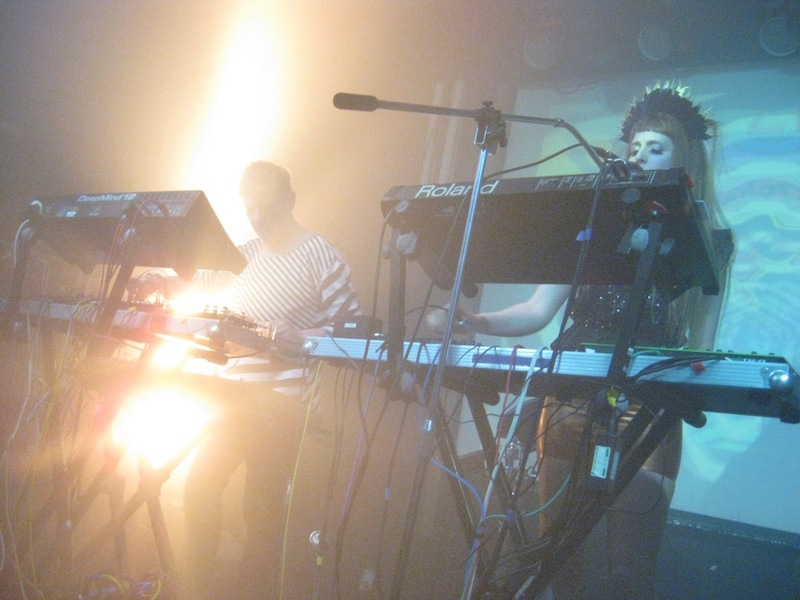 Earlier this month, Islington’s Electrowerkz venue played host for a showcase of electronic acts curated by Synth Club, a promotion outfit (formerly known as Analogue Nights) who are keen to keep synthpop live performances front and centre. 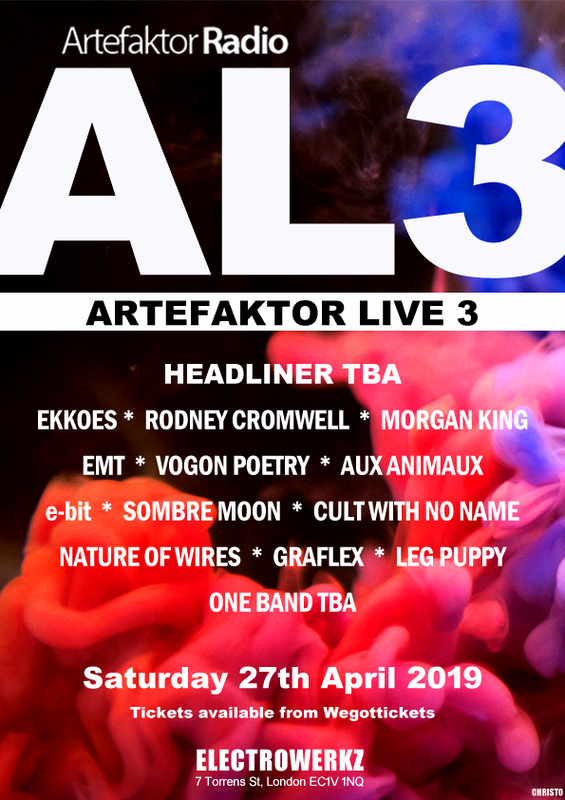 As line-ups go, this was quite a diverse selection of acts in terms of style and approach, with 5 acts in total on the bill. It was probably pushing the limits of how many bands you can comfortably put on stage in an evening however. None of the featured acts felt like baggage, but there’s certainly a logistics problem in arranging a schedule with such short gaps between each set. One of the attendees on the night commented that this was “an event for enthusiasts”, as opposed to a your common-or-garden band night at the Dog & Duck. That commentary made a lot of sense and perhaps helped to frame where the synthpop end of the electronic music spectrum was in 2017. Electronic music enthusiasts are a very diverse bunch, but this evening seemed to indicate that it was an open doors policy to all, rather than a club for the elite. DJ duties were ably handled by DJ She-Ra (Grayskull Massive) and Mark Jones (Electronically Yours) which presented an overture of sorts for the live acts to follow. First up was The Department, a synthpop outfit that features Rob Green (also responsible for organising Synth Club events) on vocals. Taking on an old school approach to synthpop, The Department ran through a serviceable setlist of tunes that included the coldwave pop of ‘Slow Down’ and the frenetic pop of ‘This Be The Verse’, a nod to Philip Larkin’s classic poem. They closed out with a new song titled ‘About A Boy’, whose staccato rhythms provided a staunch foundation for what appeared to be very personal lyrics. The brief intermission allowed attendees to catch up in the stylishly decorated covered gallery area of Electrowerkz, complete with tube carriage bar. Ordering a cocktail and adding “…and hold the doors”, you’re safe in the knowledge that the bar staff have only heard this joke 3,456 times. Meanwhile, taking the stage for the second act of the night, The Frixion comprises Lloyd Price and Gene Serene who have their own particular take on electronic music. There’s a lush, immersive quality to their material giving the duo a slow-burning appeal. ‘If U Ever Wonder’ offered up great use of vocal melody and there was also a touching tribute to Prince via a fetching cover of ‘Under The Cherry Moon’. Gene Serene’s sultry singing style might seem an unusual fit for an electronic outfit, but the results are a subtle, mesmerising form of electropop with more than a hint of gothic sensibility. Bringing things up to date, the duo also performed new release ‘Heartbroke Disco’, a much more robust number crafted from a more traditional synthpop palette. If there was any act who could carry away the Pop Star Award for the evening however, it was certainly Knight$. James Knights (who also fronts Scarlet Soho) strikes an impressive figure on stage with his shades and single black glove. With a confidence and swagger (something arguably lacking in synthpop circles), there’s a solid delivery of pure pop in the setlist from Knight$. A punchy live rendition of ‘What’s Your Poison?’ and an energetic ‘What We Leave Behind’ lends a definite pop power to the evening. But Knight$ can also dial it down a bit, such as the deconstructed charms of ‘Uncivilised’. Such was the response from the crowd following Knight$ set, that the band were duty-bound to return for an encore. In this case a cover of Pet Shop Boys ‘Heart’, a flawless rendition that also managed to give the classic tune a distinctly contemporary vibe. 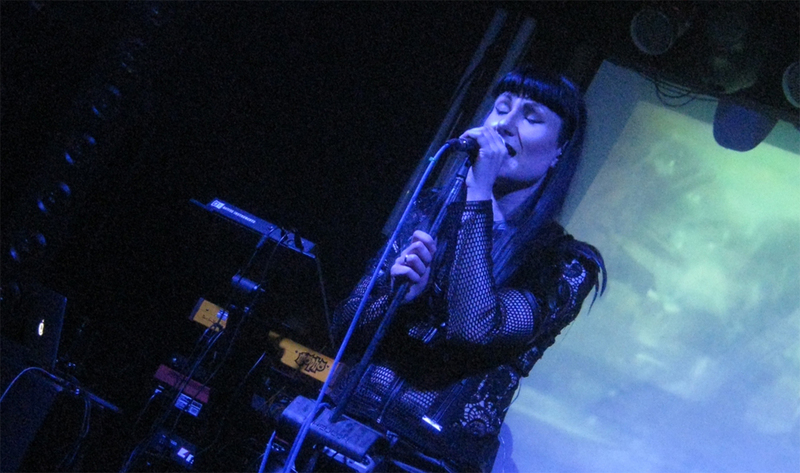 The focus of the evening was a launch party for Black Nail Cabaret’s new album Dichromat. The elegant Emese Arvai-Illes took to the stage in a figure-hugging black outfit and a face mask, lending a subtle mystique to proceedings. For their opening numbers, Black Nail Cabaret present a polished set of tunes, although there seemed to be a certain spark missing in the delivery. It’s only around the halfway point that the energy in the set picks up, particularly through the brooding ‘Satisfaction’. Meanwhile, the machine rhythms of ‘Veronica’ lead Black Nail Cabaret into more familiar synthpop territory. The final band of the evening saw Vile Electrodes take to the stage. Now effectively veterans of the UK electronic music scene, although some pre-gig nerves from the duo of Jane Caley and Martin Swan might suggest otherwise. The ominous tones of ”Like Satellites’ opens proceedings, its mesmeric drones appeared to seep into the very walls of Electrowerkz itself. A barrage of lights and frenetic percussion announces ‘The Red Bead’. “The deep cut is painless/when the blade is sharpest”, intones Jane Caley while the dancepop rhythms throb in the background. Meanwhile, ‘Empire Of Wolves’ is a tune that particularly benefits from a live outing. It also gives Martin Swan an opportunity to step back from the keyboards and give the electronic percussion a good workout. A Moroder-esque disco beat accompanies the intro to ‘As We Turn To Rust’, another number culled from the Viles’ last album In The Shadow Of Monuments (see review here). The shimmering rhythm beds of ‘Last Of The Lovers’, meanwhile, offers up an evocative electropop moment. The announcement that the gothic electropop of ‘Proximity’ is up next gets a huge cheer for one of the duo’s most popular numbers. There’s certainly a dynamic quality to the live rendition whose bassy rhythms cause the glasses of drink and assorted cans on the stage to move across the stage in time to the beats. The last song of the evening, Incision’ gives us an insistent beat that changes gear for some deep bassy chords, delivered by Swan on the aptly named DeepMind synth. It’s a classy end to a classy set and Vile Electrodes continue to demonstrate why they’re one of the best domestic electronic acts on the scene today (as well as being thoroughly nice people off stage as well). Synth Club managed to deliver an entertaining evening, showcasing some of the diverse talents at large in the synthpop scene. It’s going to be intriguing to see what they come up with next.